Help ensure your dogs dental health is in optimum condition with these fabulous Pedigree Dentastix, recommended by vets to help keep your dogs teeth and gums strong and healthy. See below for the best deal on Pedigree Dentastix & Dentaflex. Big Savings on Pedigree Dentastix & Dentaflex! Help ensure your dogs dental health is in optimum condition with these fabulous Pedigree Dentastix, recommended by vets to help keep your dogs teeth and gums strong and healthy. Each stick has a unique shape and surface, which has been specifically designed in a way that is clinically proven to reduce the build-up of tartar and plaque by up to 80%. It is recommended that you offer your dog Pedigree Dentastix on a daily basis, to help keep your dogs mouth clean and hygienic. By using Pedigree Dentastix, you can ensure consistent dental health and intensive teeth cleaning, so that you dont have to worry about whether your dogs teeth and gums are healthy. 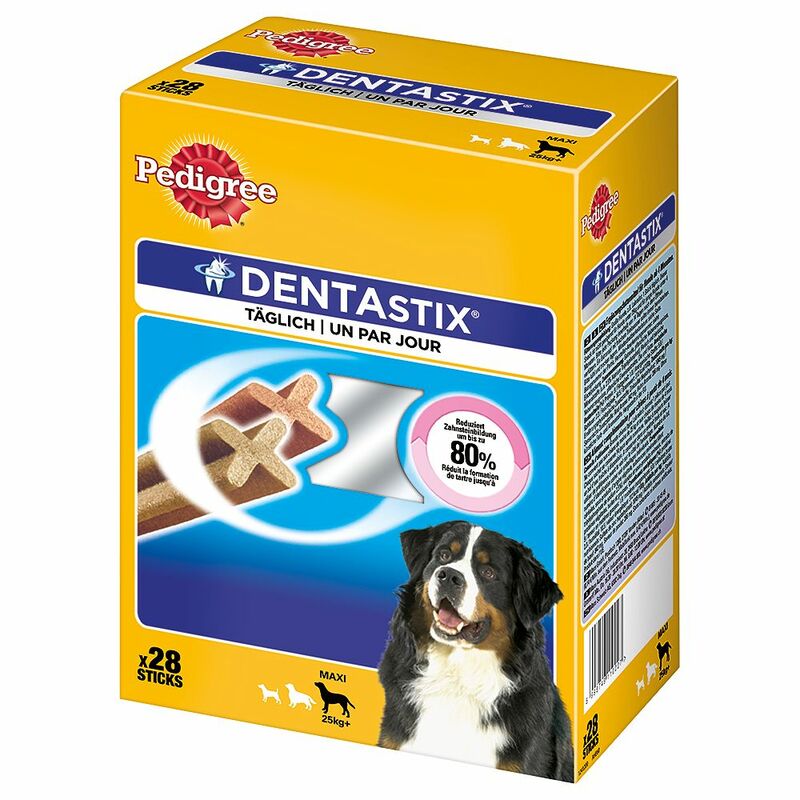 Another great feature of these Pedigree Dentastix is that they are completely digestible with no residue. This means that you can feed your dog a Pedigree Dentastix and leave it to its chewing enjoyment, without having to worry about harmful pieces being swallowed or digested by your dog. Everything in this product can be safely consumed by your canine companion - and it will demolish them before you know it! Your dog will love them! These Pedigree Dentastix are available in a range of different sizes, depending on the size of your dog, as well as being available in a range of pack sizes. No matter whether you have a Chihuahua or a Great Dane, Pedigree Dentastix have something for everyone! Pedigree DentaFlex chew snacks help to support your dogs dental health. They come in a range of sizes that are specifically designed to meet the dental needs of small, medium and large dogs. The chew sticks have a special texture that flexes around your dogs teeth to effectively clean right next to the gum line. Pedigree Dentastix at a glance: Dental chew sticks for dogs, designed to help keep teeth and gums healthy through daily chewing Unique X-Shape Combination of special shape, surface and active ingredients Clinically proven to reduce tartar and plaque by up to 80% when fed daily Completely digestible, so you do not need to worry about your dog swallowing potentially harmful substances Dental sticks available in different sizes to suit any breed of dog - small, medium and large Ideal for the following sizes of dog: Small 5 -10kg Medium 10 - 25kg Large 25kg+ Treat your dog to a delicious snack it will go wild for, whilst also caring for its dental health and hygiene! Pedigree Dentastix are the perfect way to keep your dog healthy and happy. More information about the individual varieties can be found here: Pedigree DentaFlex Pedigree Dentastix * Special offer items have limited availability and are very popular. We cannot guarantee availability of these items. The images used in this promotion are for illustration purposes only and do not constitute a binding offer. Out of stock promotional items are no longer available for purchase. Pedigree Dentastix Fresh is designed to be chewed for long enough to be effective. Its gently abrasi.. The Best Deals online for Pedigree Dentastix & Dentaflex and your essential Pet Supply Products. Order over £29 and get FREE DELIVERY on all orders today. Most orders are processed and dispatched within 24 hours from this supplier (zooplus) and their delivery service partners provide online parcel tracking facilities, active from 2-3 days after dispatch of your Pedigree Dentastix & Dentaflex order. The suplier 'zooplus' offers International shipping to the countries listed in the table below for shipping on Pedigree Dentastix & Dentaflex. Pedigree Dentastix & Dentaflex requires a £2.99 Delivery Fee from the supplier for deliveries within Great Britain. Orders over £29 qualify for Free Delivery. This can be checked using shipping calculator to your post code on the suppliers web site when purchasing.